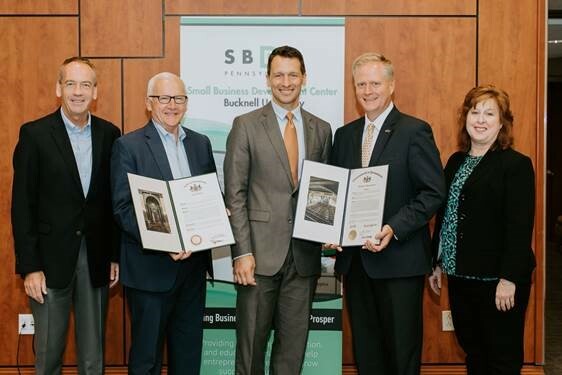 Bucknell University’s Small Business Development Center recently celebrated its 40th anniversary of providing entrepreneurs with the help they need to start and grow successful businesses in our region. Pictured (from left) are Sens. John Gordner and Gene Yaw, SBDC Director Steven Stumbris, me, and Rep. Lynda Schlegel Culver. The Pennsylvania Fish and Boat Commission recently published a public notice in the Pennsylvania Bulletin seeking comment on its proposal to add Section 05 of Penns Creek to its Catch-and-Release Artificial Lures Only program, effective Jan. 1, 2019. The commission intends to consider the proposal at its October meeting. If you would like to share your comments with the commission, you may do so in writing to the Executive Director, Fish and Boat Commission, P.O. Box 67000, Harrisburg, PA 17106-7000, within 60 days after the July 21 publication of this notice in the Pennsylvania Bulletin. Comments submitted by fax will not be accepted. Comments also may be submitted electronically by completing the form here. If an acknowledgment of electronic comments is not received by the sender within two working days, the comments should be retransmitted to ensure receipt. Electronic comments submitted in any other manner will not be accepted. Community Pig Roast hosted by COOL Ministry: Saturday, Aug. 4, 11 a.m. to 7 p.m. at East Snyder Park, Selinsgrove. Free pig roast. Pork sandwiches, hot dogs, coleslaw, macaroni salad, baked beans and desserts being served at noon. Inflatable slide, bouncy house and obstacle course, story time, and arts and crafts available for the kids. Click here for additional information. 2018 National Night Out, Lewisburg: Tuesday, Aug. 7, 5-9 p.m. at Lewisburg Area Recreation Park, Saint Mary Street. Free fun family night with live entertainment, food and hosted by the Buffalo Valley Regional Police, Buffalo Valley Recreation Authority and Union County Sheriff. National Night Out is designed to heighten crime awareness and drug abuse, generate support and participation in anti-crime programs, and strengthen neighborhood spirit and police-community partnerships. Click here for additional information. Middleburg Reliance Hose Company No. 1 Fireman’s Carnival – Aug. 7-11. Rides, games, great food, and fun! Lunch served daily and nightly entertainment. Parade will be held on Thursday, Aug. 9, at 6:30 p.m. Click here for additional information. Lewisburg Youth and Adult Sprint Triathalon: Friday, Aug. 10, at 6 p.m. for kids and Saturday, Aug. 11, at 8 a.m. for adults, both at Lewisburg Area Recreation Park on Saint Mary Street, Lewisburg. The kids event is open to children ages 7-14. Click here for additional information. New Berlin Legion Helping Hands Benefit Ride: Saturday, Aug. 11 at 10 a.m. at American Legion Riders Post 957, 640 Water St., New Berlin. Registration with ride beginning at noon. All proceeds to be divided among several organizations that directly support veterans. Cost is $15 per rider and $5 per passenger. A meal will be provided following the ride for all participants. Click here for additional information. Beavertown Rescue Hose Company Hillbilly Fever Days: Tuesday through Saturday, Aug. 14-18, at 222 Sassafras St., Beavertown. Nightly entertainment, fair food, games, vendors and more. Click here for additional information. Selinsgrove Legion Wheels for Heroes Ride: Saturday, Aug. 18, at 10 a.m., starting and ending at American Legion Victory Post 25, 524 S. Market St., Selinsgrove. Registration with ride beginning at noon, $15 for rider and $5 for passenger. Meal will be provided following the ride for all participants. Click here for additional information. 6th Annual Snyder County Night Out: Tuesday, Aug. 21, 4-7 p.m. at East Snyder Park. Sponsored by the Snyder County Coalition 4 Kids, the event offers kid-friendly activities focused on safety and wellness, and also helps the community connect with law enforcement officers and first responders. Click here for additional information. Reliance Hose Company Dog Show: Saturday and Sunday, Aug. 25-26, at the Middleburg Carnival Grounds. Click here for additional information. Selinsgrove VFW Clam Bake: Sunday, Aug. 26, noon to 5 p.m. at Selinsgrove VFW Post 6631, 940 Route 522, Selinsgrove. Open to the public. Tickets are $30, which includes drink and clams, as well as plenty of other food. Click here for additional information. Veterans who served on active duty in the Persian Gulf Theater of Operations, including Operations Desert Shield and Desert Storm, are reminded they have until Aug. 31 to apply for the Persian Gulf Conflict Veterans’ Bonus. The bonus pays $75 per month for each month of active service during the covered period, up to a $525 maximum. For personnel whose death was related to illness or injury received in the line of duty in Operations Desert Shield or Desert Storm, an additional $5,000 is available to the surviving family. Service members who were declared prisoners of war may also be eligible for an additional $5,000. For more information about eligibility and how to apply, click here. With more vehicles being the subject of nationwide recalls, a new law taking effect on Aug. 27 will require all new and used vehicle dealers licensed in Pennsylvania to disclose, in writing to used vehicle purchasers, the existence of any open, unrepaired recalls. Under Act 59 of 2018, a dealer would be in compliance with the disclosure requirement by providing the used vehicle retail purchaser a report obtained from the website www.safercar.gov, or a successor website, based on a vehicle identification number search. Consumers would still have the option to pursue civil action if a dealer fails to disclose existence of open recalls. After a woman was seriously injured by a large rock thrown from a bridge over Interstate 80 in Union County in 2014, a new law seeks to protect drivers, their passengers and pedestrians from debris thrown from bridges and overpasses. Act 65 of 2018 will require PennDOT to include protective fencing in the construction of new state-owned bridges and install protective fencing on any existing bridge at such time that a major renovation is required and the bridge is located over an interstate highway. The new law also mandates fencing on bridges where instances of suicide or attempted suicide have occurred.